Kathy Kansier was born and raised in Wisconsin. When Kathy was four years old, her mother began to teach her embroidery and other hand crafts. Note: The photo at the left is an example of Kathy's early sewing skills. It's not the embroidery on the collar of her dress. She cut her bangs the day before her appointment at the photography studio. This photo was taken when she was 4 years old. Kathy's interest in sewing garments was sparked in 4-H and her 8th grade home economics class. These hobbies expanded to include quilt making in the early 1970s. Kathy's early quilt making skills were self-taught, based on general sewing knowledge, trial and error experiences and information from quilting books and magazines. After graduating from the University of Wisconsin with a degree in psychology and philosophy, Kathy moved to Northern California. She completed her first quilt in 1974 when her first son was born. By the early 1980's, she was married, living in Western Wisconsin and raising a family. During the 1980s, Kathy began to focus on quilt history and design. She became acquainted with an Amish community in Western Wisconsin in 1984, and her study of their quilts and techniques improved her own piecing and hand quilting skills significantly. Kathy's friendship with families in this settlement still continues today. Their peaceful way of life has been an inspiration to Kathy through the years and she enjoys visiting and corresponding with her Amish friends. As a result of this continuing friendship, she has been able to study their history, lifestyle and quilts in depth and provides lectures on this subject. Her lecture includes a display of Amish-style quilts and women's hats. Kathy and her husband, David, have been married for 40 years. They have watched their seven children grow to adulthood and David and Kathy are now enjoying being grandparents. After serving as missionaries to Mexico in the late 1980s, the Kansiers moved to Southwest Missouri. They now live on 13 wooded acres between Springfield and Branson, Missouri. David owns a construction business and is also a home inspector. He often accompanies Kathy to quilt shows, acting as her "financial manager" among the venders. Kathy is inspired by every quilt she sees and as a result, she enjoys making all types of quilts using a variety of techniques. She has chosen not to focus on just one technique on which to improve and excel because she knows she would then become bored with quilt making. She currently has a number of wool projects under her needle. Kathy's award-winning quilts have been exhibited in both regional and national shows. In addition to quilt making, Kathy also enjoys rug hooking, basket making, hand embroidery, counted cross stitch and cooking. House cleaning – not so much. Kathy started teaching quilt making classes in 1995 at a local Springfield, Missouri quilt shop called The Quilt Sampler. Kathy's classes were often filled to capacity and many students took every class she offered. Her students often commented, "I have never learned so much in a class as I have with Kathy!" She began traveling and teaching for guilds and quilt shows in 1999. She has taught throughout the U.S., in Great Britain, Brazil and on quilting cruises. Her down-to-earth teaching approach has inspired many. In 2001, Kathy was one of the nominees for the Teacher of the Year Award, sponsored by the Professional Quilter Journal. Kathy was the recipient of the 2008 JPP Award. The award was sponsored by Quilts Inc. and the International Quilt Market. Only 18 international teachers have been presented with this prestigious award. The presentation of this annual awards ended in 2010. In return for receiving the award, Kathy provided a quilt exhibit of 26 quilts for the 2009 International Quilt Festivals and Markets in Houston, Chicago, Minneapolis and Long Beach. The exhibit featured quilts with doorways and entrances and was titled, Making a Grand Entrance. Photos of the quilts and information about Kathy were published in 4 major quilt magazines including one in Australia. 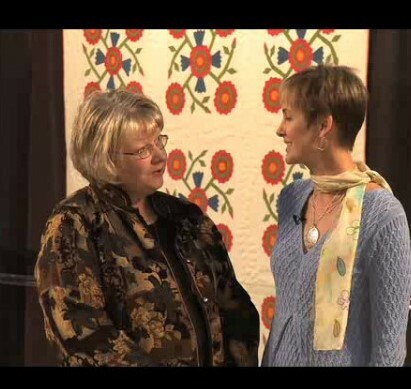 The photo to the right was taken in 2009 when Kathy was interviewed by Jodie Davis (from The American Quilter) about her award and quilt exhibit. Some of the quilts from the exhibit are posted on the gallery page of this website. One of Kathy's greatest joys is to encourage quilt makers. This joy translates not only to her classrooms but on the judging floor as well. Kathy began judging quilt shows in the late 1990's. She has also served as a volunteer on many judging floors. In total, she has been involved either as a volunteer or a judge of 8,000 quilts in 65 quilt shows. Her judging experience has ranged from local county fairs to international shows. The photo on the left was taken when Kathy was judging in Alabama in 2009.